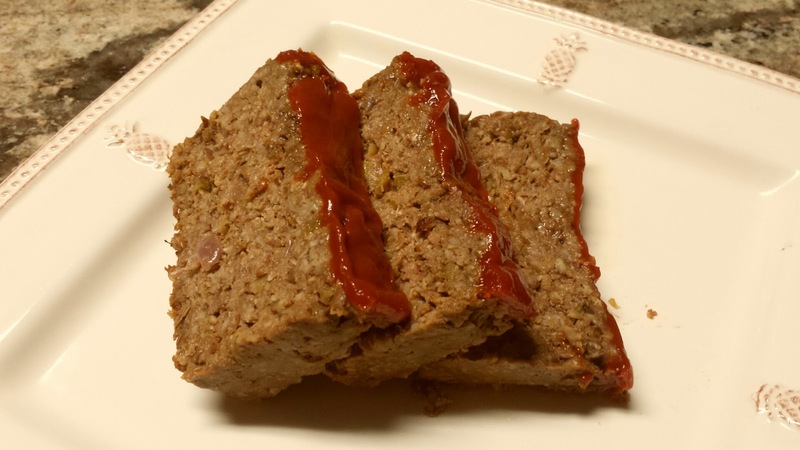 Traditionally, meatloaf is made with ground meat such as beef or pork and other ingredients and then rolled into a loaf and baked. Since, I don't eat either of those meats, I never really looked into it further. 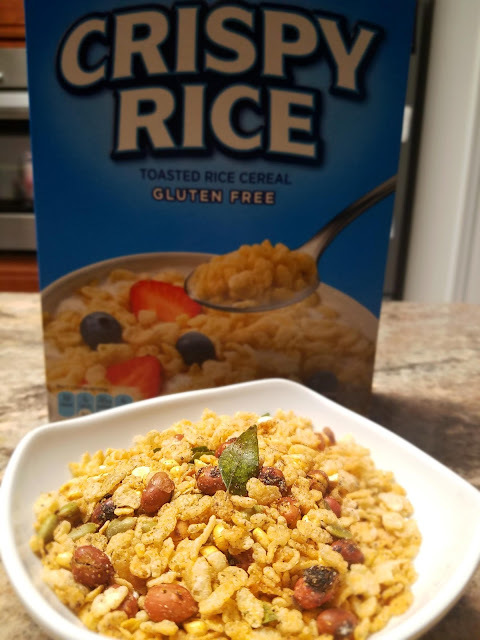 I found this recipe on a blog I follow called A Pinch of This. The blog is run by Payal, a Certified Holistic Health Counselor who wants to bring the inner chef out in each of us and help us be creative in our cooking. When I saw this recipe for a Vegetarian "Mealoaf" on her Facebook blog, I had to give it a try. The meat protein is substituted with other types of protein that any vegetarian can appreciate, such as tofu, oatmeal and lentils. I adapted the recipe from A Pinch of This with ingredients we had at home. I cooked whole masoor dal instead of using precooked lentils from Trader Joe's (listed on her blog). I also added toasted walnuts to add more hearty flavor to the loaf. Overall, the taste and texture were great. Each time I made this dish, I've added and/or substituted ingredients and it's turned out great. I would definitely recommend it for vegetarians and protein lovers alike. I've made this dish a few times already and love taking it to work everyday. Keeps the hunger away and leaves me feeling full and good about myself. Below is the recipe. Saute garlic, onions and celery on medium heat for about 5 minutes or until mixture is cooled and then remove from heat. Combine the rest of the ingredients in a bowl and add the cooked garlic, onions and celery. Spoon mixture into a loaf pan and top with a generous layer of extra ketchup. Bake for 50 minutes at 350 degrees. - I didn't have all the fresh herbs so I used Italian seasoning mixture for the rosemary and sage and fresh thyme from my plant. Carrots, Celery, Red Onion and Cornbread Oh Yum! Another holiday has come and gone, but the leftovers are still being enjoyed; the best part of Thanksgiving. This year we spent the holiday at my uncle's place and took our favorite vegetarian dishes over including Vegetarian Stuffing, Green Bean Casserole, Blueberry pie, and Brown Sugar Glazed Sweet Potatoes. 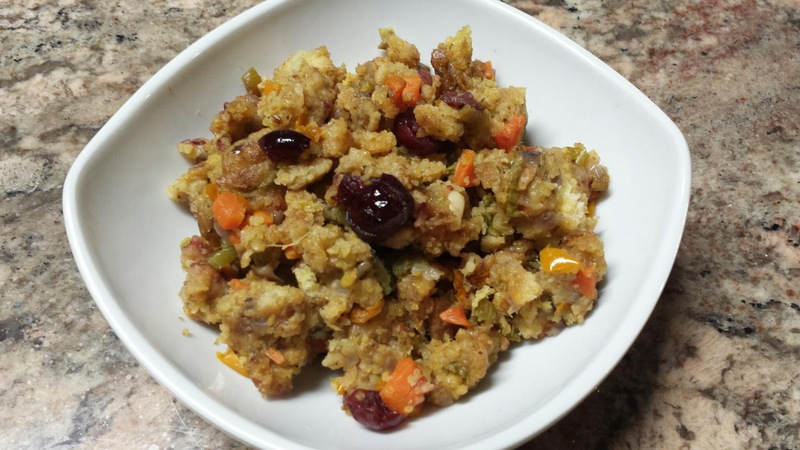 The following recipe is for the most moist and flavorful vegetarian stuffing I've ever eaten. I don't have to feel guilty eating so much of it, especially with a cornucopia of vegetables. Heat oil and butter in a large skillet and stir fry onion, celery, carrots, and bell pepper for 2 to 3 minutes on medium heat. Sprinkle salt and cook the vegetable mixture under tight lid. When the vegetables are soft, remove lid and add vegetable broth, and cover the skillet to allow the mixture to boil. When it boils, remove the lid and lower the heat to low and add in the cornbread stuffing and mix well. Remove from heat and garnish with Craisins (dried cranberries) and serve. How was your Thanksgiving holiday? What was your favorite dish? Looking forward to hearing about your foodie stories.